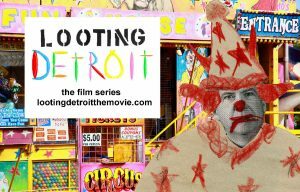 Looting Detroit – In this film series, Detroiters tell the story of how a right-wing greed circus came to town. Evil clowns looted the city, using predatory housing loans, emergency management and bankruptcy. They now run Detroit. In this film series, Detroiters tell the story of how a right-wing greed circus came to town. Evil clowns looted the city, using predatory housing loans, emergency management and bankruptcy. They now run Detroit. Detroit is a really a small town that has been under attack by the far right, like Central Falls, Rhode Island and Puerto Rico. The story in the film series is told by Detroit’s best and brightest. They are lionhearted fighters who are silenced, jailed, made invisible or openly attacked in the mainstream media if they hit a nerve of the greedy pigs who run the town an d feast on tax money. The greedy pigs run Detroit using all kinds of tricks which you will see in the film. Every night of the week you can go to a community meeting planning a protest somewhere, while buildings burn down ceaselessly without investigation and children live in relentless poverty. Detroit has been maligned in media. For those who have not lived in a Detroit neighborhood or had friends who were Detroiters, we ask you to erase everything you have heard from the racist media in Detroit, which then spreads nationally. Detroit is the kind of place where a film series like this could be made on virtually no budget – just from a strong social network of activists and community folks. Outside Detroit, a place with few resources, support came from Jan BenDor to make the film and funding from National Nurses United. We suggest you begin with the introduction, then continue the series in order. All the films are listed in the menu.